Astrobiology: Is it Relevant For Science? Biologist and activist Jerry Coyne who has a blog which defends evolution once said, “In science’s pecking order, evolutionary biology lurks somewhere near the bottom, far closer to phrenology than to physics.” If that is true, then where does Astrobiology fit into this created pecking order? Back in 1996, a Martian meteorite was discovered and there was massive hype that it contain alien life forms which were supposedly fossilized in it. But later these claims were debunked. So with all the hype about the meteorite, then President Clinton allocated funding for a supposed new science which is, Astrobiology, however, since fossilized alien life forms from Mars was falsified, wouldn’t you think this part of NASA research would no longer be needed? After all that was the reason why it was created in the first place! 2) Looking for life in our own solar system (NASA is currently doing this already with Mars). 3) Understanding life in earth’s environment. 4) Understanding how life began. 5) Understanding evolutionary mechanisms and environmental limits of life. 6) Predicting how life will shape up for the future. 7) Being able to detect signatures of life forms on other planets. Much of these objectives are conducted in other areas of evolutionary research or could be done in other areas of evolutionary research. After seventeen years and counting, there is no hard evidence for alien life forms. Scientists can’t send probes and spaceships which can land on the surface on other worlds outside our solar-system which is the best form of collecting data to draw conclusions with. Bacteria is the most fit animal on planet earth and is known to survive in very extreme environments that no other animals could survive in which defies evolutionary logic on survival of the fittest. Is alien bacteria going to be the similar as earth’s or different? If aliens did exist, I would say, different. The discovery of this particular one-cell animal is exciting no question about it and it’s a great thing to learn about, but promising the public it’s revealing clues on life concerning other planets and moons, is not science but a lot of hype. New search-and-rescue operations are being invented some of which are coming from ants! Fire ants that are able to construct narrow tunnels not much wider than their own bodies, the design of these unique tunnels allow the ants to catch themselves to prevent falling in vertical orientations is being studied for the purpose of imitating it for search-and-rescue operations! There is so much in nature that can improve human lives unlike astrobiology were Americans are paying scientists to speculate which is another reason why it’s not relevant for science! Where Is Evolution Going To End Up? One of the team researchers made a comment about how this long-term evolutionary experiment which continues to “yield surprises,” and then using the unexpected result as an insight into the “richness and complexity of evolution.” Keep in mind, all the bacteria were still members of the same species, E. coli. And beneficial mutations are in the eye of the beholder much like how fast this alleged evolution goes or if the fit or less fit survive better. Also, sometimes what appears beneficial in one context can have negative consequences in other parts. On another front considered to be a war zone, there is a pretty big battle for fitness definitions. Nature came out swinging by defending the terms, “inclusive fitness” or “kin selection” in response to Martin Nowak, Corina Tarnita and Edward O. Wilson last August, which argued the idea should be abandoned while keeping classical evolution as the main explanation! Nowak, Tarnita and Wilson remained adamant with their position. “Inclusive fitness theory is neither useful nor necessary to explain the evolution of eusociality or other phenomena,” they said. So where is evolution going to end up? It’s leading to nowhere but a dead end, it’s not a search for truth, but how nature could be manufactured without an intelligent mind, God. Yet, it’s a fact, the evidence points to His wisdom which has designed some of the most amazing things we observe in nature. The evolution ‘theory’ is nothing more than invented stories that only attempt to replace God. By so doing, the confusion increases, building faith in naturalism with a framework that has no direction nor a foundation! If Darwinism teaches atheism, can this be taught in the public schools? It’s a question that was brought up by a philosopher of biology and atheist in the evolutionary framework. Michael Ruse has re-affirmed what creationists have been saying for years on this issue. Like many evolutionists, they make the mistake of replacing Darwinism with the word, science. It’s meaning entails a broad definition that includes other areas. In answer to his question, it addresses something religious as though it has the power to define what is or not about religious views. No machines create themselves into existence then build themselves afterwards into a highly advanced, finely tuned, system which resembles intelligently made machines. Evolution vs. Christianity as well as other religions are at war. Science, on the other hand is not at war with Christianity. Would it anti-biblical to know how the brain functions or the heart? Would it be anti-biblical to invent a particular electric car that doesn’t use massive amounts of energy or need gas? None of these things are anti-biblical yet they are based on the scientific method. It’s interpretation of evolution into everything that is called science. A vast amount of things explain by evolution is not principles of logic, nor observation, experimentation and reason. For instance, mutations play a significance role for demonstrating how evolution works in nature. An experiment was conducted by Peter A. Lind, Otto G. Berg, and Dan I. Andersson from Uppsala University on bacteria. Scientists had the flexibility to insert mutations in any area along the length of the genome. The results were surprising because it caused a reduction in fitness rather than an increase which evolution requires. While mutations can be tested in a lab, it doesn’t mean evolution is true, the experiment showed evidence against what is deemed to be an absolute fact by Coyne and others. However, it does show how nature actually works which is not anti-biblical at all. Michael Ruse brings up another thing, could evolution be banned with it’s teaching atheism according to the church and state clause? Coyne and others say one can’t bring their beliefs in the lab, isn’t that restricting freedom of religion too? If a person concludes the brain for example is designed by God rather than random mutations being created then directed by natural selection, and the establishment telling you can’t believe that inside a lab while doing research, isn’t that a violation of church and state? Indeed it is, but what Michael Ruse fails to point out, judges are highly unlikely to ban evolution from public schools but the objections of it gets louder as more data falsifies it’s metaphysical premise! All too often we hear that too many people are not embracing evolution but for those who reject it, they have a logical good reason. Jerry Coyne is a professor of biology who currently resides at the University of Chicago. He regularly debates and defends evolutionary principles. Last year he wrote a book on why evolution is supposedly true. Some say he has a sad understanding of creationism but that’s hard to believe. He debates in a very tactical manner that angles to what he considers the easiest way for a winnable argument rather than taking it head on. For example, he argues in his book that if the Earth was young, then Africa and South America would only be inches apart. However, this is not catastrophic plate tectonics of which he is trying to dispute. For it is this theory that pretty much dominates creationism these days. It was first proposed by Dr. John Baumgardner, and is compatible with plate tectonics and continental drift theories. It also provides a mechanism that explains the source and recession of the global flood water. 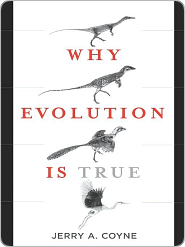 Next Coyne argues in his book that creationists deny speciation. Many evolutionists like Coyne will claim that variants within an animal’s kind is proof of evolution. Again, Coyne using tactical but not realistic arguments. Creationists do not deny variants known as “Rapid Speciation” as there was designed information by God but also creationists do not believe variants of animals are proof of macro-evolution. In order for animals to go from one kind to a totally different kind of animal requires an expansion of the gene pool with new traits. Interbreeding doesn’t create an expanded gene pool that would enable mice to turn into bats. As you can see, evolution is not that strong at all as a hypothesis or a theory. It’s story telling. Coyne uses outdated arguments to make it easier on himself to dispute but doesn’t prove anything. He avoids certain arguments like origins because it’s way too hard to prove with all that massive uncertainty of explanations. However, one thing is for certain, evolution needs not to be true! Did Evolution Predict Specialized Complexity? The strongest evidence Jerry Coyne puts out there are fossils which in turn is supposed evidence that evolution indeed did predict specialized complexity that emerged from more primitive forms of life. Darwin himself argued that evolution of life came from a gradual sequence of simpler designs. It’s quite possible that Jerry also believes in evolution remaining the same as it wouldn’t skip a beat if we found an animal unchanged (which has been found) for supposedly millions of years. It just another component which adds on to the growing complexity concerning explanations of evolution because of failed predictions and observations not successful ones. Evidence of more complexity than simplicity is showing up in the research which verifies the Bible rather than verifying the simple to complex story from evolutionary scientists. Where is the evidence for simplicity from primitive life forms? It’s certainly not found in the genomes, is it? It’s a failed major expectation for those who believe in the story of evolution. One can also question the fossil record as the way evolutionists see it because the data collected has to fit into a particular framework rather than allowing the evidence to speak for itself. If evolution was in fact a true hypothesis, the evidence would be showing up elsewhere as well.